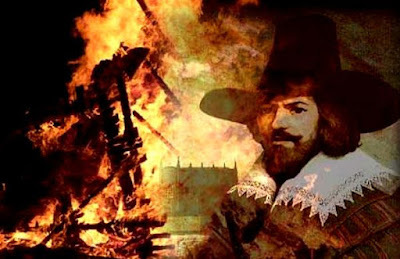 One Eternal Day: "Remember, remember the Fifth of November..."
.... It was intended to be the beginning of a great uprising of English Catholics, who were distressed by the increased severity of penal laws against the practice of their religion. The conspirators, who began plotting early in 1604, expanded their number to a point where secrecy was impossible. [In] a cellar under the House of Lords...36 barrels of gunpowder, overlaid with iron bars and firewood, were secretly stored. The conspiracy was brought to light through a mysterious letter received by Lord Monteagle...on October 26, urging him not to attend Parliament on the opening day.